Used book, 408 pages, rubbing wear to cover. From 1964 to 1972, the United States executed an extremely secret campaign of covert operations against North Vietnam. Controlled by the Pentagon's Special Operations Group, under the cover name "Studies and Observations Group" (SOG), it was the United States' largest and most complex covert operation since Wordl War II. 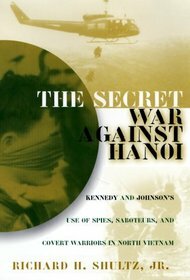 Because it was so highly classified and politically sensitive, once the war was over the story of SOG was buried deep in the vaults of the Pentagon - until Dr. Richard Schultz, one of the worlds leading experts on SOG's activities in Southeast Asia, began his impressive investigative research and wide-ranging special interviews. This item was added to our catalog on Friday 18 November, 2011.